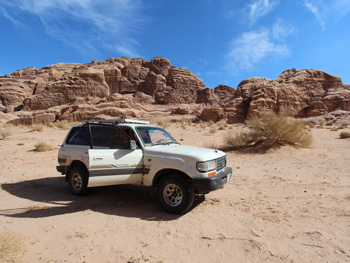 Bedouinroads in Wadi Rum has been well known for over 12 years now and is specialised in adventure tours. It's highly recommended by Lonely Planet as »one of the best hiking and adventure guides«, by the Rough Guide as a »highly respected guide, offering top-quality jeep tours as well as excellent hiking and trekking programs«, by the Guide du Routard (French) and Reise Know-How (German) others. We work with an experienced team of guides, all of them are Bedouins from the local tribe in Wadi Rum and therefore know the desert very well. We like to share our daily life with our guests to give them an insight into traditions and behaviors of the Bedouins. There are many possibilities for visiting Wadi Rum and we are proud to offer more interesting programs than the usual 2 or 3 hours long tour through the desert in a 4x4. There are many ways to explore the desert. We offer tours from only a few hours long to 10 days. 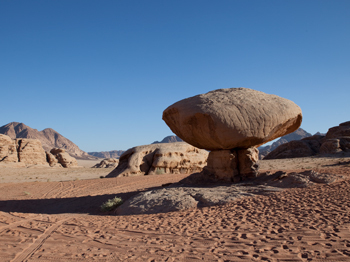 It's located inside the protected area of Wadi Rum, about 13 km away from the village. Wadi Rum is a beautiful semi desert region in the south of Jordan. 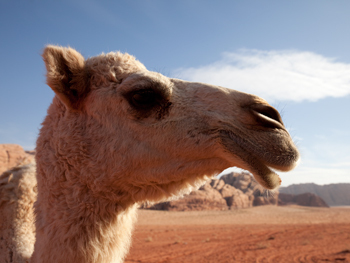 Find out more about our local guides and the Bedouin culture in Wadi Rum. 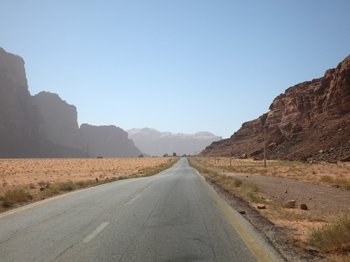 There are many ways to get to Wadi Rum: Just a 2 hrs drive from Petra and 1 hr away from Aqaba. Information about parking, luggage, money and payments, weather and transport.